When we registered www.festivaldecomedia.com back in 2002 it was but a dream. The English language Stand Up Comedy industry had been established and consolidated for decades particularly in North America, UK & Ireland. Via festival events primarily, it expanded rapidly into the Southern Hemisphere, Australia, New Zealand etc. Round about that time, English language comedy clubs began to mushroom out from the UK into Europe, (ourselves we established The Giggling Guiri comedy club as part of this wave) but it didn't stop there, it continued out to Dubai and eventually remarkably to every corner of Asia. Eventually just as the English language dominates the world so now do Stand Up comedy clubs in various languages. Each country's own comedy industry was at different stages of development and it is the nature of this development that each industry needed to establish it's own identity.The objective of the FIC 'dream' was always only to create festival events that would satisfy the desire for great English language shows that would complement the local industry. So the FIC model was born, fine-tuned and finally now offers a formula we are able to roll out in different locations. It has been an organic process but it has offered a practical learning curve and we feel now that local artists and companies embrace our independent FIC model as we deliver the biggest names in comedy into ever growing productions in our host cities while sharing and learning from the inherent diversity and shared experience one that we now propose to cross the Atlantic! Global Comedy superstar Eddie Izzard, is a champion of comedy in different languages who was already touring his shows in English, French and German. The next step for this comedy pioneer was Spanish and after spending a week of cultural and language immersion in Madrid with FIC, while selling out 6 shows as part of his globe trotting Force Majeure tour shows there in April '14 under FIC production, was a sign of our growing industry credibility and don't be surprised to see him appear next en castellano next! It frames our FIC philosophy and belief perfectly! We established FIC Barcelona in 2008 the first of our festivals, as the city offered a unique multicultural platform via its range of different ethnic communities and as an officially trilingual city it seemed natural that it should be home to the world's 1st and still the only proper multilingual comedy festival. An organic project where real trial and error (still is) was the focus for the first years to try and find what works and what doesn't in the city and how it could be applied beyond. Since 2008 we have offered a platform to some of the best comedians in the world to perform in 8 languages English, Dutch, Swedish, German, French, Russian and the local Spanish and Catalan. We hope to keep expanding and the next most obvious one is Portuguese and that means Brasil. Central to our philosophy is to create a sense of building on this sense of 'comedy commonality' from the ground up via grassroots actions such as workshops and amateur competitions, the now very successful annual Funniest FICer. 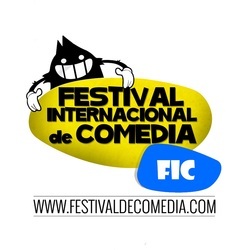 the fic '15 closing Dylan moran show will be the biggest stand alone international comedy show ever in Spain!